Prime Minister Narendra Modi took a dig at the Congress on Saturday for "misleading" farmers in the name of loan waiver, in spite of considering them as merely a "vote bank". He further said for the BJP, farmers were the "annadata" (provider of food) for whose genuine welfare his government had been working sincerely. "We consider farmers as the 'annadata', unlike the previous governments who considered them as a mere vote bank," the prime minister said, addressing a crowd here in Jharkhand, while elaborating on the difference between the Bharatiya Janata Party (BJP) and the Congress. Modi was addressing the crowd after laying the foundation of several irrigation projects in Jharkhand, including the Rs 2,391.36-crore Koel Karo Mandal dam which will provide irrigation to a 19,604-hectare area in Jharkhand and also in parts of the neighbouring Bihar. "Earlier, the Congress government had forced farmers to borrow loans and today, they are misleading them with promises of loan waivers. "Had I considered farmers as a vote bank, I could have waived their Rs one lakh loan...this (loan waiver) could have provided an immediate succour to farmers, but our priority is to provide them with facilities to boost their produce for doubling their income and this will help the farmers for generations," he said. Modi took a swipe at Congress president Rahul Gandhi, saying "he might not be knowing what is Koel...whether it is an irrigation project or the name of a river or a bird". The prime minister praised Bihar Chief Minister Nitish Kumar and his Jharkhand counterpart Raghubar Das for working together for this ambitious irrigation project spread over the two states and said this was a good example of federalism which others should learn. "At a time when many states are fighting with each other (over water and other issues), the way Nitish Kumar and Raghubar Das and the MPs of Bihar and Jharkhand worked together for the Koel Karo Mandal project is a good example of federalism which others should learn," he said in the presence of Das and a large number of MPs from the two states. Prior to addressing the public rally, Modi also handed over house keys to five beneficiaries of the Pradhan Mantri Awas Yojana (PMAY). Taking a dig at the previous governments, he said they were least bothered about farmers' welfare in Jharkhand and the delay in the completion of the Mandal dam project was a proof of that. The Mandal dam, the work on which began in 1972 but was stalled since 1993, will be built on the North Koel river in Barwadih block of Latehar district. The prime minister laid the foundations of several development projects to the tune of Rs 3,500 crore in Jharkhand. Talking about the PMAY, Modi said his government had ended the role of agents and middlemen under the scheme by providing money to the beneficiaries directly in their bank accounts. "During the days of the government run by a remote control, only 25 lakh houses were built under this scheme in five years, whereas we, in nearly four-and-a-half years, have built around 1.25 crore houses," he said, comparing the performance of the previous Congress-led United Progressive Alliance (UPA) government with that of the present Bharatiya Janata Party-led National Democratic Alliance (NDA) rule. "Our aim is to provide housing for all, be it in the rural areas or in the urban areas. 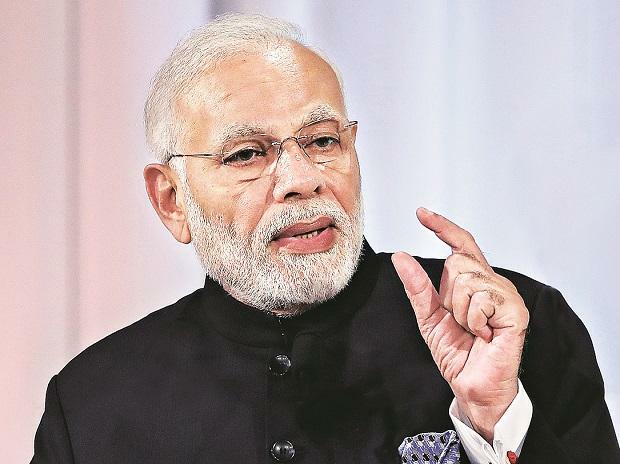 We do not believe in naming schemes after politicians, the benefits doled out under these schemes is what matters," Modi said, adding that the houses provided under the scheme would have all the basic amenities, including gas connection, electricity and toilets. He alleged that in the past, the work culture was such that many schemes remained only in files for long and asserted that now, a system of rigorous monitoring of every scheme was developed so that those were completed within a given time-frame. Unlike in the past, the work now was not done in air-conditioned rooms, Modi said.